You are here: Home > MyTouch3G Version 1.2 In The Works? MyTouch3G Version 1.2 In The Works? So this is an interesting little tidbit sent my way in the last 24 hours. Apparently February 10th gives way to the MyTouch3G 1.2. My original thought was that the Fender edition might be this MyTouch3G 1.2. However, my source states that with some suspicion that it might be the original MyTouch3G coming with a 3.5 mm headset jack. This stems from material that hints toward two sets of accessory skus, modified to fit “both” devices. We don’t know what this means really and if its just the Fender edition which is a little disappointing. We imagine as the day approaches it will become cleaner. Either way, let the speculation begin. Can’t wait to get rid of this phone. It is ok, but I’m just bored with it. I’ll be buying HTC HD2 day # 1 to replace this phone. I’m in the EXACT same boat as you. 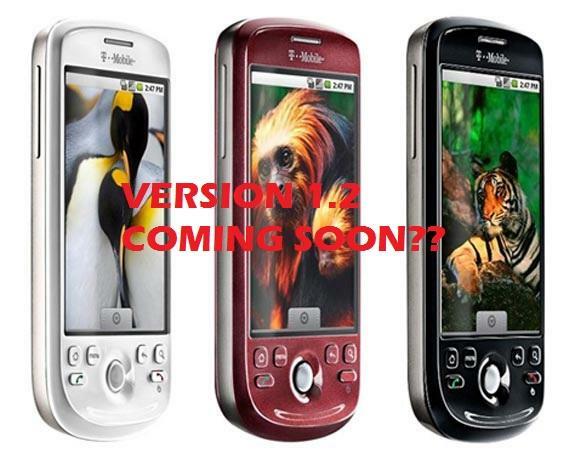 First the G1v.2 now the MyTouch3g Version 1.2. I mean really…. I am still waiting on the G1v.2. and although everyone says its a stupid name and will never happen…. I would think the same for a MyTouch3G Version 1.2. To be honnest I do hope they release a newer version of both phones… all with a 1Gz Snapdragon Processor, more memory, and hopefully more battery life…. oh and of course a 3.5mm jack. Who knows maybe they will… maybe from here on out Google will require any developer or manufacture of phones to have certain specs in order to run the newest and future releases of Android. If this is a case and there indeed is newer versions of these phones like they are stating… then hopefully anyone who owns one can upgrade early with a full discount. I Love my G1… however unless Googles releases an Apps to sd (where apps can run from an Sd card) I will still be in search of the ideal Android Phone. True the Nexus One is close but I would want it with a real keyboard (for the emulators of course). I guess its a good thing I can’t upgrade now because with all these phones coming out and the rumors… it might be best to wait. I just hope Tmobile doesn’t let me down like Google did with the Nexus One. I still can’t believe how they just abandoned this phone after all the marketing behind it. It really pisses me off! T-Mobile doesn’t know how to advertise. They should be all over the Nexus one and the 3G 7.2. The Nexus One isn’t exclusive to T-Mobile! Next month, it will be available for Verizon and shortly thereafter available for VodaFone. It would be stupid to push advertising for a product in which you don’t have exclusive rights. As with 3G 7.2, it would fall on consumers deaf ears who are already tired of the AT&T/Verizon “My 3G is better” ad war! I agree with you. At what point are they going to update teh rest of us who have The Mytouch or G1 to 2.1. My gut is telling me to hold off for a mth or 2 b4 i go get a Nexus 1. For some reason it seems to me that HTC only made this phone in response to Moto Droid making the Mytouch look outdated. Lets see what happens when Garmin and if Moto releases new phones for tmo again. My dad works for T-mobile and they reciently let him demo the MT3G Fender. Nothing new or special. There shouldnt be anything new with the Fender edition beside the color and the 3.5mm jack! 1. Your right t mo does not know how to advertise. 2. Fender edition is still the same phone just the diff jack and and baby puke color 3. Verizon came out of there contract with android 2.0 so the android phones will be getting the update here in the next few weeks..
3. Verizon came out of there contract with android 2.0 so the android phones will be getting the update here in the next few weeks.. ??? Verzion phones or Tmo? He Said here, which meant that he wasnt referring to Verizon plus he works “here” at Tmobile. Stupid ? reread man. Don’t forget the Fender version has a 16gb card included and some music pre-nstalled…. but heck without apps to sd… who on earth would need 16gb of music on a phone??? I myself can’t even fill an 8Gb card. psst: the fender edition is shipping with a designated 3.5mm headphone jack (and a 16gb micro sd card installed)! the fender edition should launch in the next few weeks for the next merchandising change out because most store received accessories that are fender specific today. If it still has the same slow processor I’ll pass. I would like to know how several of you can afford to keep buying phone after phone. I definitely can’t. I have bills to pay. Talked with my HTC rep today at my store, says we will be getting 5 different versions of the Fender Editon, one he said was going to be Eric Claptons Edition. All that’s different from the first Mytouch is the 5 editions,3.5mm jack now, 16gb card w/preloaded albums. That would be SO NICE. Now, if the phone’s keyboard would only get better, and a faster processor, we would have something going. if u tell me that there’s more than one option for the phones color, i’ll put more attention to this news. oh and the price for the phone stays relatively the same to its original. They should have done this the first time. It makes no sense to advertise as a music powerhouse when you have to use a dongle to use it. In speaking of that, I lost mines and I am dying to use my Skullcandys again. T-Mo has a bunch of retards working for them. Idk if I can afford the HTC HD2 anytime soon, but if they do release this, they should let customers & me (Since i’ve exchanged my MyTouch 3G in twice, and in a minute i’m gonna be on my 3rd exchange) exchange theirs in for free or at least pay a small difference to get it. That just wouldn’t be fair to the people who bought it originally. I’m getting tired of them releasing phones, then releasing another phone or a different version behind it when people are spending their hard earned money purchasing these phones, and using their full contract extensions (Which I did for the Original MyTouch 3G, which was stupid of me). It’s like they get top in customer service, but do you really care or think about your customers if you’re going to do stuff like this. Really? You want your cell phone company to give you a new phone every time they come out with something new just because you bought a phone from them once? Agreed, unfortunately “loyal” customers have a feeling of entitlement. Nevermind that tmo is a business, they think just because they have been there for a while, they are owed something. When you read the opinions, they are so whiny. I have bought 11 high priced phones from T-mobile, thank you very much. The original MyTouch 3G is a load of crap to me, i’m on my 3rd one now. I know how the market works & how company’s are only worried about “PROFIT”, but do you think i’m going to be the only one pissed that they used their full upgrade for a device (or spending their hard earned money on the original MyTouch 3G), and they release update version of it months later? That’s a slap in the face. It’s not even going to be a upgrade to the original version, it’s basically going to have stuff that the original one should’ve had. So, with that said I feel entitled. My phone that i spent my hard earned money on for a company I “TRUST” & cares for it’s customers is mediocre & is not what was promised to me or cracked up to me, so once again yes I do feel that way. I like the form factor of the current MyTouch. If they keep the form factor, increase the memory, include Android 2.1 pre-installed, 3.5mm jack, and offer it for $99 with contract; I think that’s not a bad deal. Oh, and don’t change the colors. I want BLACK! Upgrading the processor would be a plus. I’d pay $149 with contract for that. Why????? why would they spend time and effort on this? Whatever. Shoot, considering what the N1 offers for the money, anything new has a lot to stand up to. At less than $200 with a contract, anything new will have to be priced right too. A MT3G with a bit more RAM can’t sell for $249 like they did at launch at this point. No, but remember the discount on the N1 is contingent on switching to the least cost-efficient rate plan. I don’t know if anyone knows this but the fender edition not only has all the external features that everyone knows about but it also has a new music application which is really sweet that lets you flip through your artwork. Yet the best best new feature is that the phone has more internal memory. I’ve used both phones side by side and the fender edition is so much faster with the upgrade in internal memory. Switching through applications is amazing and on point. I’m sure thats what they are also doing on the my touch 1.2. Im amazed at how much faster android works and cant wait to get one of these phones with a 1 GHz processor in my hands.